Columbia-TriStar, standard 1.33:1, languages: English DD 5.1 [CC], Spanish, French & Japanese 5.1, subtitles: none, single side-single layer, 9 chapters, Making-Of Featurette, Talent Files Including Sound Bites, Trailers, rated G, 40 min., $24.95, street date 3/14/2000. Directed by Ben Stassen. Narrated by Paul Harper. Take a ride on the wild side with Thrill Ride: The Science Of Fun! A white-knuckle adventure filmed in 70 millimeter, Thrill Ride takes full advantage of the power of large-format film, locking the audience into the front seat of some of the wildest rides ever created - including The Big Shot at the Stratosphere, Las Vegas and the rollercoasters Kumba and Montu, located in Busch Gardens, Tampa, Florida. Explore the heart-pounding possibilities brought to life when the imagination meets the computer work-station with director Ben Stassen, a renowned expert in the field of Computer Generated Imagery (CGI). And learn how cutting-edge ride designers employ technology originally developed by the military and NASA to create the mind-bending ride simulators of today! Using footage from some of the most popular rides ever created, Thrill Ride; immerses the audience in the action...so fasten your seat belts for fun! 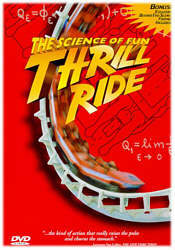 Thrill Ride: The Science of Fun is a DVD that may delight or disappoint you depending on your perspective. Going into it, I thought it'd basically be a collection of first-person shots from roller coasters; it originally appeared in the IMAX format so this made sense as a big conglomeration of coaster thrills. However, that's not the case. Yes, we do see a fair amount of first-person film from roller coasters, but the emphasis is actually more on other attractions such as motion simulators like the Back to the Future ride at Universal Studios. We see some snippets of it and other similar presentations. Most of the film's 40 minutes is devoted to the "science" of these attractions. As such, we get rudimentary discussions of the ways that thrill rides are designed. We hear a brief history and learn some minor details. We also get a short lesson in the creation and presentation of IMAX films. Ultimately, it's all somewhat interesting but not very compelling. The documentary segments that attempt to enlighten us about the ways rides are invented is too cursory and lifeless, and we see too few first-person shots taken on attractions to make the program worthwhile in that domain. It also doesn't help that I'm watching all of this on a 27 inch TV screen. IMAX films can be breathtaking in their huge-screen dimensions, but much of that impact disappears on a television. The details of the image still seemed discernible here - unlike something such as Everest, which lost a lot in the translation - and you get some of the "you are there" feeling, but it still falls flat for the most part. As much as I like to see films presented in their original aspect ratios, I have to admit that fullscreen is probably the way to go for IMAX offerings. Even in fullscreen, the onscreen action often appears very small; something that's very easily detected on a huge screen can vanish to near nothing on a TV. If the film appeared in its original ratio, that issue would be exacerbated and it's likely that very little detail would be discernible. I'd be interested to see both versions presented on a DVD - for the record, there was more than enough disc space on TR to do so - but still anticipate that the fullscreen version would be preferable. Thrill Ride appears in a fullframe aspect ratio of 1.33:1 on this single-sided, single-layered DVD; as such, the image has not been enhanced for 16X9 televisions. Although the "large-film" format should encourage higher resolutions, Thrill Ride has not made the transformation to home video well; although it presents some gorgeous sights, it also can look surprisingly bad at times. Sharpness is the main issue. It seems to be cranked up far too high, and I witnessed absurd amounts of jagged edges and moiré effects. Some scenes get away without any flaws, but there are rare; more often we see some very coarse and harsh images. I've seen enough IMAX films on home video to know that this isn't an inherent problem, so I'm at a loss to explain why this movie displays such ridiculously overenhanced edges. The print itself also shows a few flaws. I saw occasional speckles and spots, but they were fairly rare. No other signs of grain or other problems appeared. Colors looked absolutely terrific. The film displays a tremendously diverse palette and all of these hues are reproduced boldly and vividly. Black levels also seem strong, and shadow detail is fine. Remove the grossly overenhanced edges from the equation and you have a good-looking DVD, but unfortunately that's not the case. Much better is the film's Dolby Digital 5.1 soundtrack. Thrill Ride uses some terrifically immersive audio which really helps create a "you are there" atmosphere. All five channels are utilized aggressively for most of the movie. Panning, split surrounds - you name it and it appears here. The audio definitely adds a lot of atmosphere. Quality of sound seems consistently good. Harry Shearer's narration sounded clear and natural, with no intelligibility problems. The only issues came with "The Miner"'s speech, which often seemed thin and slightly distorted, but that was a very minor part of the film. The music appears warm and smooth, with strong low end, and effects were tremendously realistic and clean; I noticed some distortion during the "Big Bang" segment but that seemed mainly due to the limitations of my speakers. All in all, this film offers a terrific audio mix. The DVD tosses in a few minor supplements. We get talent files for four of the filmmakers. These include brief but decent text biographies of each participant plus each one also offers a few "soundbites". Those short interview clips last from about 10 to 25 seconds each and make for a nice little extra. The DVD's booklet also supplies short biographies of six of the filmmakers. Finally, we find a watchable featurette that runs for a little more than five minutes. It falls firmly into the "promotional" category and does little to expand upon the film itself, but it's a painless and mildly interesting experience. Which is about the best I can say for Thrill Ride itself. The movie simply tries to cover too much ground in its brief running time and it ultimately seems unsatisfying as both a documentary and as a piece of sheer fun. The excellent Dolby Digital sound aids the experience, but it falls short frequently due to some often-weak images, and the package includes few supplements. Save your money and skip Thrill Ride; even amusement park diehards will likely find it disappointing. Ultimate Rollercoaster--For fans that seek that rollercoaster thrills, visit this terrific site to find out about the different new rollercoasters that are being constructed. Rollercoaster!--A fun and detailed description of past and present rollercoasters, from the most to the least terrifying.